I love a good thematically linked anthology. But killer plants? Not a single author I’m familiar with? I wasn’t sure what to expect and at any rate this book exceeded any expectations I might have had. This is pretty much a how to manual of creating a good anthology. Pick an original theme. Check. Line up some incredibly impressive talent. Check. Make sure everyone sticks to the topic yet offers a new twist on the subject. (Although obviously the carnivorous plant theme can’t be avoided, but it was done differently in the few tales that took that direction) Check. Major kudos to the editor and the publishing house.Now onto the stories themselves. You know that thing where everyone reads out their fortune cookie contents and add in bed at the end. This is sort of like that. Takes the story to an entirely new level.Starting off with Wisteria, where Donna Leahey creates a memorable take on a woman scorned…with plants. Next up darkly humorous tale by Najas about an overly enthusiastic gardener/amateur grafter …with carnivorous plants. (One of those mentioned above)Weedy is a charmingly demented boy meets girl story…with plants.Next a story of a woman who takes a very practical approach to gardening and plant food. (Another one)DG Sutter creates a horrifyingly bleak tale of a family trying to survive Tennessee during a drought…with hungry plants.Ken Goldman’s Harvest Moon is one of my personal favorites. There is a circus (love circus stories) in town for a very unique performance…with…corn. See, you thought I was gonna say plants. Alas, variety.Ethan Nahte offers up one of the goriest tales in the book, about a peat bog that may or may not be hungry.Screamin’ Siren is another great one, not a circus this time, but a carnival, with a very unique ride.Luke Murphy’s Redpath is one of the more original tales plot wise, taking a fascinating, distinctly cinematic approach to pissed off nature. Ryan M Cady reminds the readers that you can’t in fact go home again in his lovely melancholy trip down a memory lane thick with weeds. Some terrific writing here.Renee’s La Viness’ epistolary tale is a strikingly claustrophic diary of a lonely woman’s last days…with vines.Next a man innocuously enough named Santa tells a seriously morbid story of young girl who learns how to garden, but not how to share her parents ‘ attention with her newborn sibling.Melissa Osburn’s Bittwersweet Dreams about a girl lost on a babysitting gig gone horribly wrong was sort of like Into The Woods on acid. Personally my least favorite, but nevertheless a worthy read.Jennifer Clark’s Stalagmite Girl was for me the most moving and emotionally engaging of them all. A story of passive cruelty, cruelty by inaction or indifference, this one really packed a punch.Adams’ Weird Mary is essentially light entertainment after the previous story and most resembling of a paranormal chick lit. Light fun…with a variety of plants.Jeffrey Mays’ serves up a twisted tale of a very peculiar pet. Not one of my favorites, but decent.Seeds tells a tale of a man whose life is radically changed by picking up a new hobby. Can you guess what that hobby is? You got it, gardening. Gardening can change your life. This collection should at least teach the readers that much. And rounding up strongly with Plot 264, great story with mystery, nightmares and vegetables… that may put you off of gardening after all.And there you have it. Brand new kind of awesome. Botanical horror. Because zombies and vampires are so completely overdone. This is one of the best collections I’ve read in a long time, some really terrific indie talents to discover. Highly recommended. 4.5 STARS Psycho botanists, lethal Australian Alligator Weeds, swamp witches, and house-crushing vines. Growing Concerns merges my love of horror with my love of plants and gardening. Some authors have mastered the craft of showing, and dished up a visually satisfying feast, such as Ethan Nahte in Pete's Peat. This story included the right amount of gore and will satisfy plenty of horror enthusiasts. Jocelyn Adams's Weird Mary was refreshing and particularly quirky, in a good way. Screamin' Siren by Roy C Booth and Axel Kohagen was the stand out for me. The kind of carni horror that King would write, these two we're telling me ridiculous things, and I was eating it all up with a spoon. In fact, I'll be looking for more of their work. Though some stories were (sometimes) a little awkward or clunky in the writing department, they made up for it in the storytelling. There were a few scary, edge of your seat tales, like Maybe Another Day by DG Sutter. But mostly Growing Concerns was thrilling, sometimes humorous, and the right amount of strange. It was hard to imagine how the stories could be different with such a seemingly narrow subject matter, but the Eco horror genre is broader than expected! Growing Concerns proves that it can be done, and well. A great read. The pending release of Growing Concerns had me antsy from the get-go. An underexplored subgenre like eco-horror is bound to bring the weird out of the wallpaper, and several stories in this anthology did just that, and did it well.Robert J. Santa's visceral horror "Of Sweet Peas and Radishes" left the hair on my forearms standing up, and that is not an easily accomplished task. His particular use of voice in this story is also enviable. "Plot 264" by Darren Todd is smartly written and well "executed," full of hideous, nauseating nightmares and, what's worse, the reality of what's causing them. "Bittersweet Dreams" by Melissa S. Osburn is another story with a leap into the surreal, but more than that, it's a terrifying look into the damage done by a life of regret and longing.Luke Murphy's "Redpath" uses a clever juxtaposition of modern and ancient to heighten the weight of the decision that an eco-warrior must make on behalf of her entire species.Ken Goldman's "Harvest Moon" was a really fun read: expertly written, genuinely spooky, and the author shows off a talent for writing regional accents, something notoriously difficult to do well.I also really enjoyed Jeffrey Mays' "Malefic," which read like it was being narrated by a lexicomaniacal Vincent Price. Although beautifully written and even thought-provoking at times, I don't really see this alchemical story's connection to the anthology's theme, which made it feel a little out of place, squished in amongst killer vines and soul-sucking swamps.That brings me to some constructive, I hope, criticisms.The first is a minor technical inconvenience regarding the ebook. It would be really helpful if the table of contents had been coded so that readers can navigate directly to certain stories and back to the TOC.The second is that several of the stories would have benefited from a good solid round of proofreading. A few typos here and there are expected, but when there are several big ones per story, it's just distracting. The editor in me often had a hard time seeing past the duplicated, incorrect, or missing punctuation marks and words. So I think a heavier editorial hand would be an improvement in future volumes.My third and final criticism is that I was just a tiny bit disappointed with the lack of edginess. What I mean is that most if not all the stories have a pleasant classical feel, relying on tried and true themes, settings, and premises, but few to none do any pushing at the conceptual or experimental aspects of writing horror or storytelling -- one exception might be the wretched abjection in "Of Sweet Peas and Radishes." Given the newness of eco-horror as a literary (sub)subgenre, perhaps that's a next step in thinking about what can be done to the miracle grow to really probe boundaries and generate new fictions -- and thereby, new reading audiences. 3.75 out of 5.0 StarsSummaryGrowing Concerns is a collection of short stories that look at the world of plants in a whole new way – a horrific ecologically inspired way. The reader is greeted with a total of eighteen different stories from a wide array of authors, including C.J. Andrew, Ken Goldman, Jocelyn Adams and Darren Todd to name a few. The stories themselves are quite varied. One story tells the tale of a carnival ride and a tree that take on a life of their own. Another forces the reader to take a long hard look at what happens when the need for water gets a bit too desperate. Of course, there is the story of Pete's Peat by Ethan Nahte in which the swamp has the last word when it comes to murder, or Redpath by Luke Murphy in which an eco-activist gets a lot more than what she bargained for.Overall ImpressionsAlex Hurst, the editor of this short story anthology has done a pretty good job of finding quality writing for a subject matter that few have tackled with any success. Often when horror is brought to the mind, plants are not at the top of the list. Most of the time they take on either the comic outlandishness of Little Shop of Horrors or the over done creeping menace of a vine. However, Growing Concerns not only offers different stories, it also offers different outlooks on the ways plants can affect our lives. In these stories the plants take on revenge, hunger, thirst, love, murder and justice and transform these themes into something uniquely their own.I will admit, there were times during the reading in which the pace was a bit slower than I would have liked, and the overall sense of suspense was lacking in some places. The characters, however-- including the various vines, weeds and trees that dominated the book were surprisingly multidimensional which was a very nice change of pace.If you're looking for a thought provoking collection of horror stories that will make you think twice about pulling that next weed, this is certainly one you should add to your collection. When most people think of the Horror Genre they think of the Supernatural, Dark Fantasy, Sci-fi, Psychological Horror, Gothic, The Satanic, Paranormal, and even Suspense. If you were to mention Botanical Horror most people would sport confused looks upon their faces. I was lucky enough to be able to read a few stories falling within this new genre. I do have to say when I first heard about the genre I had the same blank face you would expect from most. I had no idea how stories about plants could be thrown into the mix with other popular sub-genres. However, once I began to read the stories I actually liked them so much more because of how realistic that each one was. When I was reading them it all seemed like everything I was reading about had the potential to happen, the stories seemed more real and therefore gave them more of a chill factor. Needless to say I was pretty captivated. For the record, yes...Plants can indeed be scary.I was fortunate enough to review Growing Concerns, an anthology of short stories and chose three of my favorite stories to give short reviews on and talk about more in detail to give those reading this a better idea of what I'm talking about.The first story is “Don't Waste Anything” by CJ Andrew. This one captured me because of all the elements of every day life within it. We have all heard about online ads or online sites that various people use to try and find love. Well what if one day you go to meet up with the person you met and all goes awry? The man in the story wakes up naked and suspended finding out that he is next on the list to becoming plant food. I enjoyed how the villain in this story is female which deviates from the normal male villains you see. I won't give away how this story ends but I will say I enjoyed the twist in the ending. For anyone that enjoys suspense and crime this one is for you. For those interested in online dating, this may change your mind.The second story that really caught my attention is “Screamin' Siren” by Roy C. Booth and Axel Kohagen. I love carnivals so I knew right away that I would love this one. The big twist was finding out that this one particular ride doesn't run on mechanics or anything like that, it powers itself and resembles a tree. There's a lot of mystery in this story and I liked that. The things that got to me as well as how this ride was able to cause a lot of people to become enamored with it. Again I won't give away details as to what happens in this story or how it ends but I can say that it will make you rethink carnivals. Probably my favorite story out of all of them is “Weird Mary” by Jocelyn Adams. One of the things that I liked the most about this story was all of the magic and energy within it. We really get to see here how spirituality connects with Mother Nature for a good yet horrific cause. What I mean by that is that the people who are killed are rapists, stalkers, and people who do bad in the world. The main character is someone who could be most closely related to that one weird person who lives on your street. The person on the street who most people are afraid of and speculate about. We think that it's weird how she wants stalkers to find her but later on we see the bigger picture for her reasons. At this point we get to see what I mentioned about the spirituality here, and again I am not going into detail to ruin it. This story does have a little bit more fantasy and magic in it than the other ones but it made me think about how we have the power to change who we are drastically in response to events in our life. It made me think that anything is possible if we have enough energy and will power. I was also able to relate to Mary the main character.In closing, for the horror enthusiasts out there I would deeply recommend this one. The stories are different than what you normally read but surprisingly believable which brings such a big sense of horror to it. I always give respect to those who deviate from the norm and decide to do things different which leads me to call this the next big thing in the horror genre in my opinion. 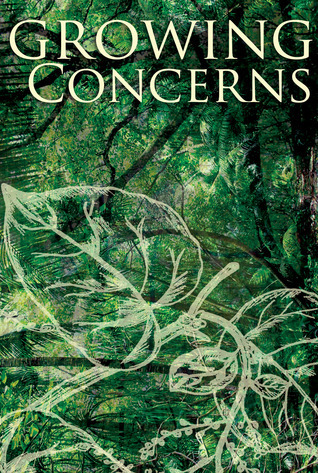 When author Rhonda Tibbs told me about Growing Concerns: An Eco-Horror Anthology edited by Alex Hurst, I was more than intrigued. Halloween being my favorite holiday where dressed as a witch I scare all of the neighborhood children and shriek at the top of my lungs while touring haunted houses, I knew this was a must read. If looking for fear in the form of words on a page, not an easy task for an author I might add, Growing Concerns, a short story anthology which makes one view plants, flowers, and soil in a whole new phosphorescent light should be the next book added to your reading list.Beginning with Leahey's "The Wisteria," the "hook" begins with the bitter conversation of a married couple:Charles leaned out the back door and pointed an accusatory finger, "Dammit, Gia, look at this! "It was obviously my fault. I had no idea what he was talking about, but still, it was clearly my fault, "What is it Charlie? "My husband's scowl twisted his handsome face into an ugly mask. He hated being called Charlie. I liked to pretend it just slipped out but really, I did it just to annoy him. (Loc 62 of 4094)Thus, the tone of a decaying marriage set the stage against a backdrop of full of life (literally) purple blooming wisteria. So, I can now with all certainty type, any notion of planting wisteria near our own deck in the hopes of a shade canopy have withered. Furthermore, reading the tales of these devout gardeners made me second guess any thought I ever had of joining a garden club. In Magas' "Journal 6 of 8: Techniques in Grafting," gardening takes on a new level of commitment, "He bled a little where his scalp split, but blood is good. The plants like blood (Loc 382 of 4094). . . It's a strange realization to come to- finding that you feel more for a dying plant than you do for a dying human being" (Loc 487-8 of 4094).In addition, the vivid descriptions in Cady's "Those Were Days of Roses," enchants all of a reader's senses:The front lawn yawned open like a bloated black tongue, thick tufts of black and green weeds spiking out of oozy quicksand and steaming black mud, the hiss of snakes and the gurgle of swamp gas as a slow, foul breeze blew out of the innards of the estate . . .." (Loc 2339 of 4094).Growing Concerns, beyond a shadow of a doubt, would have matured to a five out of five rating from me if it were not for the missing articles sprinkled throughout the anthology as well as incorrect verb tenses as in "choose" (Loc 893 of 4094) instead of "chose. "Nevertheless, for the purposes of book club, tomato pie comprised of ". . . late-planted heirlooms. Followed by sauteed bell peppers and squash, white corn, and a fresh mint tea" (Loc 3594 of 4094) would be sure to satisfy the herbivore within us all. However, bear in mind, a restful night's sleep after such a feast may not come to fruition. Okay, this collection of decidedly frightening stories involving growing things has made me worry about the upcoming spring season and the need to trim my shrubbery. I will certainly think twice about mowing the grass from now on. All kidding aside, I truly loved this book. I can't say that I liked one story over the others but each one had its own special personality.Scientists tell us that plants cannot feel pain, but do we really know this for sure? Perhaps they have a form of intelligence that we cannot comprehend. Do they communicate with each other on some higher level? Of course we don't really know but these notions are the grist for "Growing Concerns" mill. We are fighting a war that we will surely lose because once we leave this planet, the growing things will take over what we leave behind. The only question is how soon that will happen. Buy this book. Read it. Read it again. Learn from it. I don't usually read short story books, but I am quite glad I had the opportunity to read Growing Concerns. The compilation is filled with variety of style. I loved "Redpath" by Luke Murphy. "Of Sweet Peas and Radishes" by Robert J. Santa is pretty disturbing. "Bittersweet Dreams" by Melissa S. Osburn was a pleasant surprise. I liked that I wasn't quite sure what was next.Fans of the horror genre will certainly find something they like, along with some thought provoking surprises. I suspect some writers will also walk away with a few new fans. "Malefic" by Jeffry Mays was a surprisingly good read. Dude needs to talk to that thing. Great way to end the anthology! As anyone who has watched the tree scene in the first Evil Dead movie can attest, plants can bee seriously creepy! The Eco-horror anthology _Growing Concerns_ , edited by Alex Hurst, is a mix of successfully horrifying tales and sophomoric short stories. Overall, it was enjoyable. Read with the understanding that not everything will be a gem. The final story, "Plot 264" by Darren Todd, was particularly good. I received this anthology free in exchange for review. There are some excellent short stories in this collection. Set everywhere from creepy swamps to a not-circus and lush back yards, these tales can tendril around a subconscious and grow into disturbing dreams. Ariel Hudnall Donna A. Leahey N.J. Magas Barry Rosenberg C.J. Andrew D.G. Sutter Kenneth C. Goldman Ethan Nahté - Welcome to my author page.I am a fantasy writer who was raised in the wilds of the south. Lightning storms and hurricanes created the playpens of my youth, and in the summers, I used to spend all of my time dodging horseflies in a golden river, catching fish and snakes with my bare hands, swinging from vines, and falling out of magnolia trees.In the dawn of my adolescence, my family took me on a journey across the United States, from the white sands of Pensacola, FL, to the razor’s edge of the Hell’s Backbone in Utah. We finally landed in Marin, CA, where lotus eaters tried to make city folk out of us (but miserably failed.) I currently live in Kyoto, Japan, working as a writer and dream-smith.Feel free to stay a while, leave a comment or send me an email. I can be contacted via the comment form at the bottom of this page. If you feel so inclined, you can also follow me on Facebook (AlexHurstAuthor) or Twitter (AlexHurstTweets). I update my blog fairly regularly at memoirsofhereafter.wordpressThank you for your interest in my work.